Here’s a new twist on “Smokin’ a Fatty” that we cooked up for the 6th Annual PNW Eggfest. This recipe was a crowd pleaser and will not disappoint at your next gathering. For all of you who stopped by to say hello this year; Thanks for your support! Click on the picture to zoom in. Cut cheese into small bite sized cubes. Cut jalapenos in half and clean. Cut into small chunks the same size as the cheese cubes. Cut bacon slices into thirds. Wrap a meatball sized piece of seasoned sausage around 1 piece of cheese and 1 piece of jalapeno chuck. Wrap with bacon and secure in place with a tooth pick. Do this 115 more times!! Start your Big Green Egg. With a plate setter upside down or other indirect cooking method, place and smoke at 350. I use hickory or mesquite wood chips. Don’t forget a drip pan, those grease fires will get ya’. 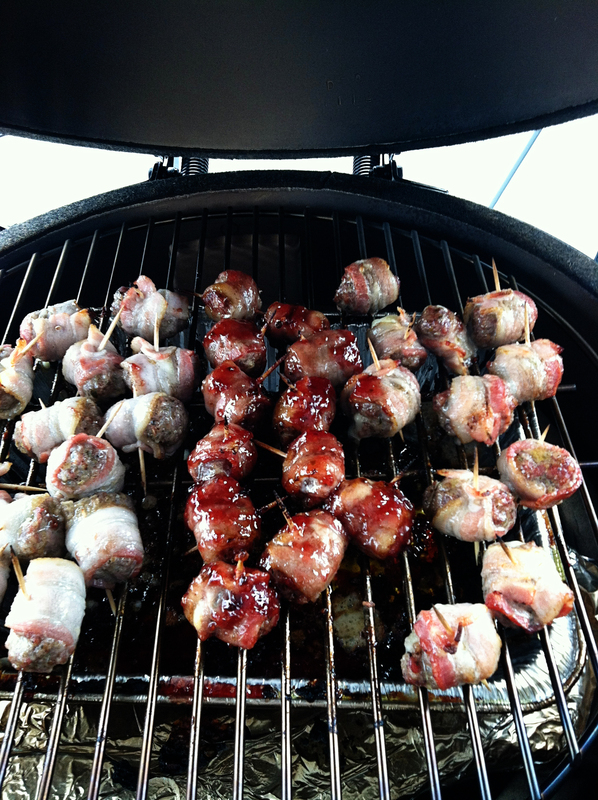 After about 20-25 min, or when you determine your ‘lil fatties are about done, baste with Raspberry chipotle sauce. What I do is pour your chipotle sauce into a bowl and drop the ‘lil fatties in. Completely cover and place back on the grill for another 10-15 min smoke. Pull off the grill and share with a hundred of your closest egg-thusiasts! !